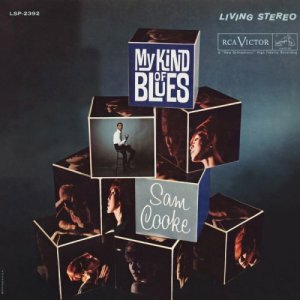 Sam Cooke's voice is justifiably legendary, but most of his RCA albums are astonishingly little-known today, and My Kind of Blues explains why this is so, at least in part. The singing is superb throughout, but the repertoire, even in 1961, was not terribly well defined or the recordings well arranged. The basic problem lay in the nature of Cooke's career arc, which probably straddled too many styles and musical worlds for his own good – the spiritual and the secular, pop and rock & roll, and pop and soul, all as defined in his time (which was, effectively, from the early '50s to the early '60s). The "blues" as a label on an album had a much wider meaning than it would have had at the other end of the decade, or any time since – Cooke was part of a world where adult pop still held sway and seemed, at least for the LP market, a more attractive target than the teenage or even collegiate audiences of the time. Thus, the "blues" heard here would have been appropriate for a mainstream singer – say, Sinatra, or Nat King Cole – circa 1961 (or, really, about 1957 – Cooke's producers were very conservative) – rather than what most listeners today would call blues. Brassy, big-scale orchestrations abound, and even the leaner textured songs, such as "Little Girl Blue" and "You're Always on My Mind," rely on a reed or horn section, respectively, to augment the electric guitar, piano, bass, and brushed drums at the core of their arrangements. Some of this works beautifully, as on "Nobody Knows You When You're Down and Out," which was a good enough song to make it into Cooke's set at his Copa appearances, and, along with a handful of other tracks here, also onto the compilation The Rhythm and the Blues (and the box set The Man Who Invented Soul). All of this is what would probably be called "smooth blues" (assuming it is defined as blues at all in a modern sense); it's more soul of a pop variety. But Cooke's voice carries it – even the weakest arrangements and material get elevated, as the best of Cooke's interpretive instincts overcome the worst of his producers' instincts. Given its limitations, My Kind of Blues was never going to be a defining album in Cooke's output, and had he lived past 1964 it almost certainly would have been relegated to his "early period" in a full career. Its strongest moments, of which there are many, stand on their own, however, and the leanest of the arrangements point the way toward greater things that were to come, including the best parts of Mr. Soul and the whole Night Beat album.